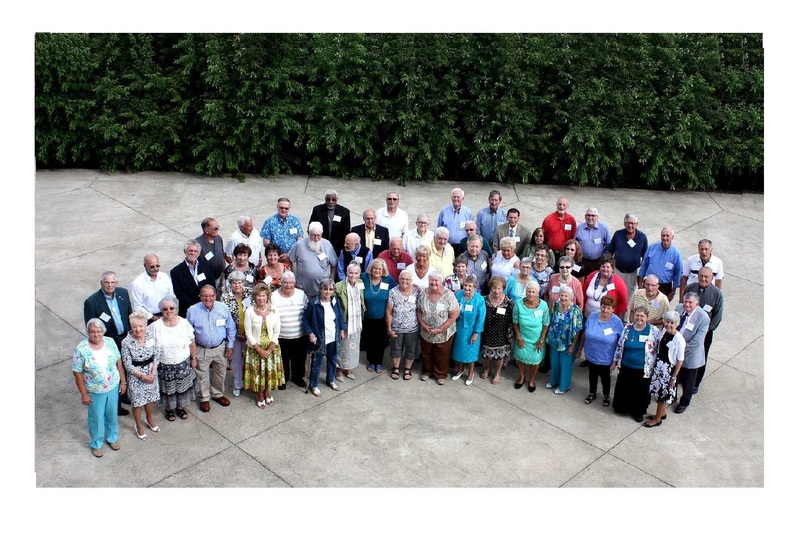 Welcome to the new ZHS Class of 1957 website. This site will be a bit smaller than the previous site, but we hope the info is just what you are looking for! Well, we did again. The annual get together was held marking our 61st year after graduation. The event was held at the Virtues Golf Club in Nashport, Ohio, the same venue as last year. The turnout was great with 77 classmates, spouse and friends coming together in friendship. Classmates came from all over the country to be with us. Betsy Charles Sharp from Pennsylvania; Nancy Veyon Patterson from Virginia; Ron Wetherall from Florida, returning after missing last year due to brain surgery and doing very well; Dale Richards from Arizona; and Beverly Murphy Factor from California; plus all the classmates who came from all over the state. We were so glad to be able to be together once again. Doris Jewett Flynn gave the benediction and we had a delicious meal before the entertainment. A huge thank you went to Dr. Raymond and Connie Watiker for providing the funds for the great entertainment by the Remember Then group. Lots of great music and dancing throughout the evening. We played a little game of Search and Mingle. Each classmates was given a record picture of a classmate attending the event and they had to find and give the correct record to them. The picture in the record was the graduation picture. Here is hoping each had a little fun with the project. The evening ended way too soon. Here is hoping we can get together again next year and the classmates who wanted to come will be well enough to join us again. I have posted some pictures to our Shutterfly account. Keep checking as there should be more, but remember you must be a member to look at them. It is so easy, all you have to do is join, as I am keeping it a private account for us. There hasn’t been a lot of response on the account lately. If in the future I see that not enough classmates are viewing it, I am considering not posting the pictures. I enjoy doing it so everyone can see the fun we have, but it is time consuming if there is little response. I would appreciate feedback as to whether to continue the pictures or not. God bless the Class of 1957. 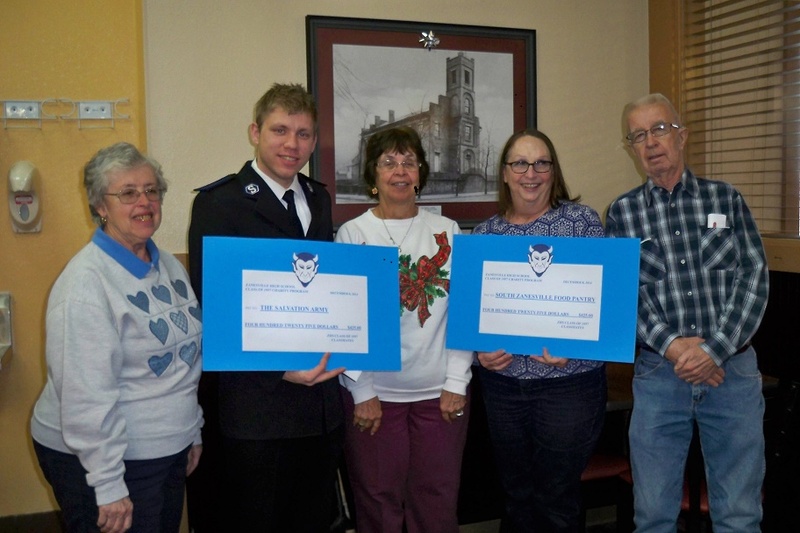 ZHS CLASS MAKES DONATION OF $1,000.00 to The Salvation Army! 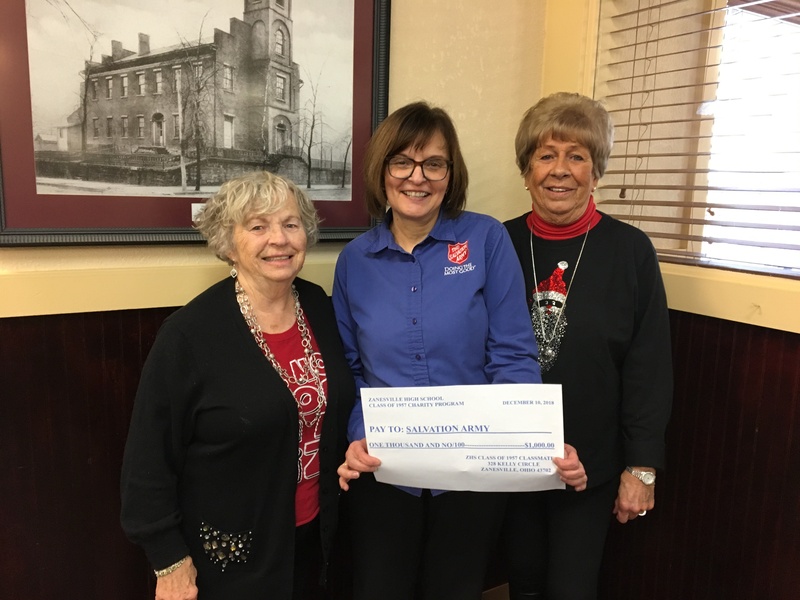 Jeanette Hennessy, Mindy McCloy of the Salvation Army, and Sandy Douglas. The next monthly luncheon will be held on Monday, May 13th, 2019, at the Golden Corral, 1586 Northpointe Drive, Zanesville, Ohio from 11:30 A.M. to 1:30 P.M. Please mark you calendars for the second Monday of each month. All classmates and spouses are invited to join us.